Using the Highlight effect, you can apply a highlight to a drawing. Contrary to the Glow effect, the Highlight effect does not convert your drawing into a glow, it applies the glow onto your drawing. The resulting render includes both the drawing to its glow. 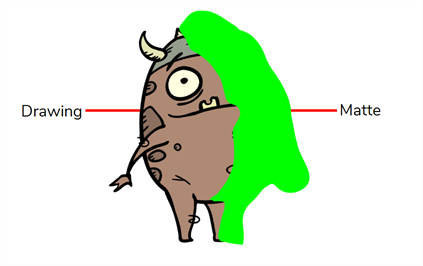 The Highlight effect uses a matte drawing layer to determine which areas of the drawing to apply the highlight to. The highlight will not be applied outside of the drawing or outside of the matte. In the Timeline view, click the Collapse/Expand button at the right the Highlight layer. 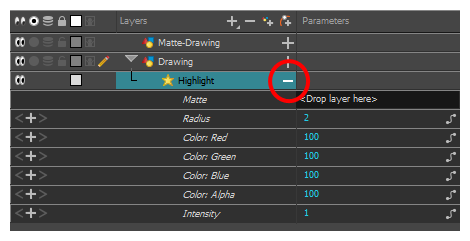 Drag and drop the matte layer right of the Matte field, under the Parameters column. The value of the Matte parameter will be the name of the matte drawing layer. Display the Highlight properties and adjust the properties to control the type and amount of blur and the colour of the highlight effect—see Highlight Layer.